Ask President Trump and your governor to stand against gender confusion in our nation’s schools! Who would have thought that we’d need to ask our elected officials to protect boys and girls from the insanity of gender confusion—where young people are being told they are not a “he” or a “she” but rather a “they”? But this is where we find ourselves today and we cannot remain silent. It is time we begin shouting from the rooftops that the emperor has no clothes for certainly we know better. God created humans male and female (Genesis 1:27). 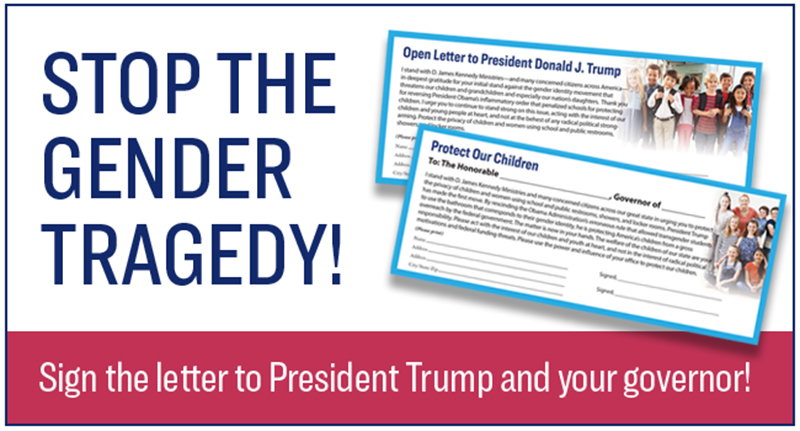 By signing the open letter, you will be joining with thousands of others for the sake of America’s children—perhaps your own children and grandchildren. Don’t wait. We will forward your letters to President Trump and your governor so that they will know you want them to protect the privacy of children using school and public restrooms, showers and locker rooms. To request your open letters, fill out the form below and we will send them to you right away. We are sorry but this petition is no longer available.